If you are a homeowner and are looking to get your home greener, you should be very interested in what is going on right now. Local towns and cities would begin to issue municipal bonds, and the proceeds would be divided up as loans to homeowners to acquire clean re-newable energy systems like solar systems. The homeowner would end up paying off the loans via a special property tax assesment over time. Not a bad idea right? I think it’s great, and thousands of homeowners all over the country agree. But, as you would expect there is always something in the way of a great idea. This time it’s another usual suspect. The lending companies and mortgage brokers of America. That’s right, those guys who put our country into total financial troubles in the not too distant past. The mortgage companies are worried that when a home which has one of these governement loans gets forclosed, they government loan will get paid off before the homeloan, potentially causing the private lenders to lose out on some more money. In recent weeks, the issues surrounding these programs have come to the attention of the yet another federal department, the Federal Housing Finance Agency, and this group of course is taking the side of the lenders. So, who knows, it looks like unless someone starts to think more about the earth another good financing idea for solar power might hit some more roadblocks. I just wonder how the large banks are going to feel when there is no more oil on the planet to fly their private jets around the globe each day. How will they feel about that? This is the average electric solar panel system purchased in the United States. from a solar electric system, the chances are you would need quite a bit larger system than one which is only 3 to 4 kilowatts. The exact amount of electricity that a solar panel system of this size is going to produce is going to depend on the usual factors for any solar system anywhere in the US. These factors are: 1) Sunlight hours, 2) Shading and 3) Orientation towards the sun. To a lesser extent, outside temperature will also affect the solar panels production of electrity, but that’s nothing to be too worried about. Buying a solar panel system of this size is going to be eligible for at least a 30% federal tax credit, and probably other state and local solar incentives. What you should do is talk with the solar professional prior to agreeing on any prices and make sure the details of the incentives you are eligible for are written down in writing before you pay for the solar system. Make sure to explore your options when it comes time to buy the system. For over a year now, there are many great state backed and federally backed financing programs for homeowners to purchase solar power systems. One of the main reasons is that these solar systems are looked at as a long term investment, and they add value to your home, so banks are more willing to loan money to homeowners because of that. Also, there is a instant generation of income or return on a solar investment which also make a loan for this more appealing to banks. 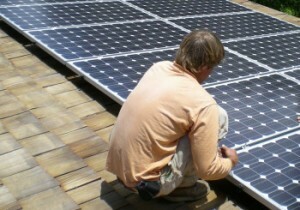 There are several Green Banks, which specialize in loans for solar systems which you should investigate as well. These banks often know the process very well and make it much easier for homeowners to buy solar power systems. The solar professional you work with will also know about some good financing alternatives for you to help you get started.